Hi Everyone! I´m a french and English teacher and I´m glad to share my work with you! Remember naughty George? He´s back! My pupils´ favourite character in English classes! Now he tells you about his daily routine. True/False exercises, questions, writing exercise (positive/ negative sentences based on pictures. Hope it will be useful! Completely editable and made to introduce daily routines and present simple. 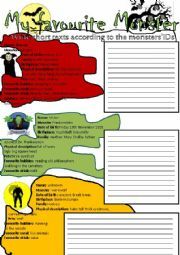 Very easy to motivate students!Useful to revise too! 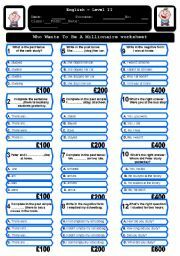 Hope you´ll have as many millionaires as I did!! So you have these wooden blocks at home? Use them and let your students have fun while learning prepositions of place! 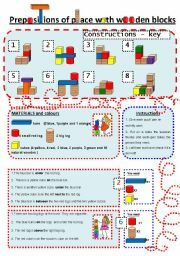 8 activity cards with instructions for students to build constructions with key included. Organise a building race: the team who gets the constructions right faster wins. They just love it! Thank you ESL community! 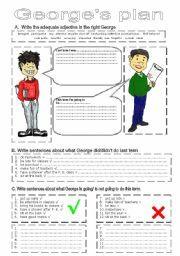 worksheet made to introduce the future "be going to" in contrast with the past simple:George was a very naughty pupil the first and second terms, but now he is going to be a new George! 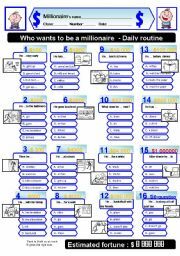 A two-pages worksheet on the movie "The Smurfs" to motivate ss to learn English. A smurfastic movie. I just couldn´t help doing this ws. Hope you like it! 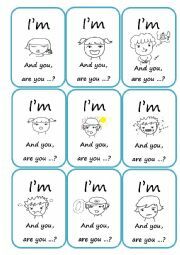 Here are some speaking cards for young learners to practice vocabulary about feelings, question "how are you?" and yes/no answers with to be. Works great as a "Go Fish" game as well. Hope it may be useful. Excellent to make ss describe houses in a creative way! 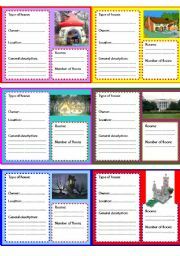 (12 activity cards)Scrooge´s vault, Mickey , Hello Kitty, Hucklebery Finn, Queen of Hearts, 7 dwarfs, the White house, the Smurfs... ´houses are here! Ss love it! Have fun! A writing activity for Halloween. Ss must use the information given to write short essays about their favourite monster! Verb to be, have got, physical descrption, likes and dislikes: everything is included. Hope you´ll find it useful.Have a spooky Halloween! 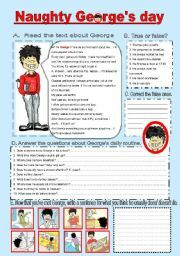 A worksheet specially done to motivate my students to learn english while viewing a film. 1st of a series I´m working on: 3 pages of exercises about characters, order of events, likes dislikes, True/false exercise. Hope you like it. The celebrities childhood photos: What were they like? Powerpoint to introduce the past simple (verb to be and have) with laughter.Have fun! powerpoint presentation with Snoopy, the Simpsons, and many others to learn the superlative of superiority.